An All Inclusive Approach Enabling Maximization of Tube Life Extension For Steam Reformers Utilizing Both Internal and External Inspection Methods Combined With Remaining Life Assessment. Providing plant operator / owners the ability to substantially extend tube life in Steam Reformers is essential in maximizing use of capital investments in Methanol, Hydrogen, and Ammonia plants. With the price of nickel at an all time high, the cost of installing a single reformer tube can be upwards of $20,000 USD. However, in today's highly competitive markets the effect of the unplanned downtime in reducing the plant on-stream factor is far greater than the installed cost of a single reformer tube. Over the last 6 years over 100 plants around the world have applied the Laser-Optic Tube Inspection System LOTIS™ "internal" laser-based reformer tube testing technique to obtain invaluable tube creep information as it relates to tube damage in the early stages as well as allowing the determination of when a tube should be retired from service. The LOTIS process collects millions of data points from the internal surface of the reformer tube which can be modelled to provide powerful visual aids necessary to make operational, mechanical, or design changes to increase the efficiency and performance of a steam reformer. The internal inspection is carried out quickly during a turn around when the reformer catalyst is being changed and takes less than 3 minutes per tube. Access is only required from the top of the tubes where the catalyst is discharged/loaded and no access to the reformer box itself is necessary. The equipment utilized for this examination consists of the compact LOTIS Model-400M system in conjunction with the appropriate laser mapping probe (Figure 1). This laser-based surface mapping system is based on the principle of laser optical triangulation . The LOTIS probe projects a small laser beam (typically 0.5mm in diameter) onto the target surface, this provides precise radius measurements to 0.05mm of the inside surface of the tube at each sample point, which for a typical 100mm ID tube means creep strain is quantified to within 0.05%. 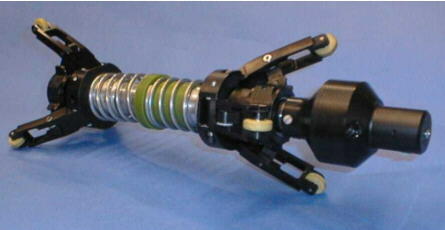 The laser source, optics, and photo detector are housed in the forward section of the probe. The optics housing rotates at 1,800 rpm and is drawn through the tube so that a helical sampling pattern is generated (Figure 2). One of the key differences between the LOTIS technology and previous tube inspection methods is the fact that the complete tube surface is inspected (Figures 3 and 4). This significantly improves the quality of data and allows for detailed reformer analysis as well as tube condition to be assessed. With this degree of tube inspection it is widely acknowledged that the 3-Dimensional (3D) graphical modelling images allow a much better interpretation of the creep damage to the reformer tubes and will allow identification of issues such as fluegas maldistribution or flame impingement caused by faulty burners as shown in Figure 5. In a number of different instances, detailed inspection data coupled with the visualization provided from LOTIS has been able to help positively validate unusual phenomena within furnaces. In many cases furnaces have been rigorously modelled using modern simulation tools  to investigate the root causes of tube failures. Two of these case studies are discussed in further detail below showing the excellent correlation between the physical measurement of tube creep in comparison to the physical models and process parameter measurements. Correct sizing of tunnels and ports is essential to balance fluegas flows within the box. Fluegas maldistribution will contribute to the variation in tube temperatures and lead to reduced furnace efficiency and limited firing rates. Also, in some circumstances, poor design of the tunnels and ports can have a much more dramatic effect; it can lead to premature tube failure. The failure is caused by localised creep damage at the bottom of the tubes and is shown schematically in Figure 6. The area of damage is typically 100 to 150 mm (4 to 6 inches) long, with the tube above and below the failure showing no damage. 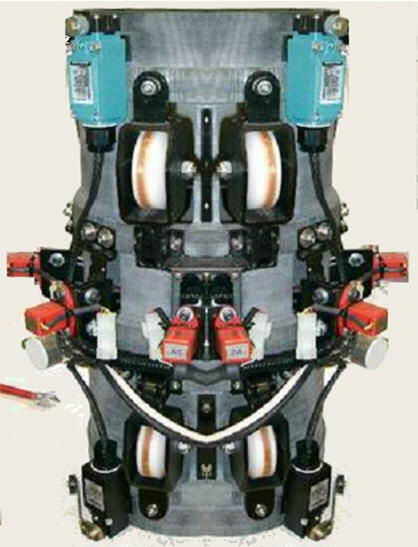 For a large hydrogen plant reformer the 3-D image following a LOTIS inspection clearly shows the symmetrical damage pattern in-line with the arrangement of flue gas extract ports on this furnace (Figure 7). The key to understanding this effect is that the tunnel forms an almost complete enclosure, with only small exits (through the ports) back into the box. The radiation within the tunnel is therefore approximately black-body, doubling the effective emissivity of the gas and producing a higher incident radiation flux on the tube wall opposite each port. As a service offer for this KATALCO™ catalyst user, Johnson Matthey investigated the effect in detail using a Monte-Carlo simulation (packets of radiant energy ["photons"] are tracked, with reflection and absorption / emission at surfaces). Figure 8 shows the early stages of the simulation, with a relatively small number of photon paths. The steady-state radiation flux at the tube wall is obtained by averaging the arrival rate over a sufficiently large number of photons. Figure 9 shows the incident radiation flux as a function of height above the furnace floor, with well-defined peaks corresponding to the positions of the ports. The tunnel port effect and this modeling work are described in detail in References [3, 4]. This phenomenon was noted during a reformer survey on a large primary reformer using KATALCO catalysts. An unusual tubewall temperature profile was noted (Figure 10). During an on-site reformer survey in which Johnson Matthey Catalysts assisted the operator in detailed investigations significant maldistribution was confirmed in the furnace by injection of dry powder to track the flue gas flows patterns from the site test. It could be seen that the fluegas near the wall was flowing upwards. The furnace was modelled by Johnson Matthey using Computation Fluid Dynamics (CFD) to determine theoretically whether this up flow at the reformer walls would be expected. The result of this model is shown Figure 11. As can be seen, the model predicts that there is up flow at the walls and there is cross flow from the outer lanes to the inner lanes at the top of the furnace. The root cause of the problem was a mismatch between the burner capacity, outer lane sizing, and the outer coffin sizing. As can be seen, the flow patterns predicted by the CFD model match that seen at the plant. Johnson Matthey offered a range of solutions to resolve this problem and these are discussed in more detail in Reference . The pattern of damage for this style of furnace, in respect to tube creep strain measured, is consistent from the LOTIS inspection helping to cross validate the inspection and modelling capabilities (Figure 12). Looking in more detail at the characteristics of an individual tube from the centre of the furnace there is a once more an excellent correlation between the maximum TWT predicted by REFORM  and the LOTIS result showing maximum creep damage at the bottom of the tubes (Figure 13). Since reformer tube inspections are only possible at shutdowns, typically occurring every 4 to 5 years, it is important that the inspection technique generates accurate and repeatable results. The following sections detail a summary of the advantages and disadvantages of the various techniques available [1, 7]. This is the most rigorous method and the most costly since it requires that tubes are removed from the reformer and then cut up to allow for the amount of creep damage to be determined. The cost of this is prohibitive and a representative sample of 10% would be needed, then the complication of the decision on where to take the samples, top or bottom of tubes. This is the most basic technique and is often not utilized regularly enough to highlight operational problems. Checks should be made for bulging and distortion, which is an indication of excessive creep, as well as glazing which indicates overheating due to flame impingement. This technique is not sensitive and will not identify damage within the tube material and is very much dependant on the experience of the inspecting eye! Nevertheless, always useful combined with other methods. This technique transmits sound from the outside of the tube from a transmitter to a detector sensor. Creep attenuates the signal and allows for identification of damaged areas. As the surface of the tubes is rough and the material grain structure is coarse, this makes it difficult to apply normal frequency ultrasonic signals. In practice, our experience shows this technique can falsely identify areas of damage and in other instances it can pass tubes which then prematurely fail in service and have to be replaced. Like the ultrasonic attenuation tests, eddy current is applied from the outside of the reformer tube and detects the variations in flux density generated by an induced electromagnetic coil. The sensitivity of this technique is compromised when the tube material's permeability changes. Due to the environment in which the reformer tube is operated and the materials it is made of, there are significant permeability variations down the tube's length after the first day it is placed into service. The eddy current technique also has a reduced sensitivity to damage located at the inside surface of the tube wall. In some cases, this test method may provide false positives which will prompt a perfectly good tube to be removed from service. Just the opposite may also happen, resulting in a damaged tube being left in the reformer causing in tube failure, causing an unplanned outage to make necessary repairs. 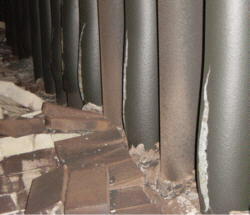 A summary of the abilities of the different inspection techniques to detect damage are shown in Figure 14 effectively as the traditional techniques need a significant degree of structural deterioration (cracking) to be present before they can rate the tubes. Provided the inspection technique gives adequate discrimination, then the results of the inspection can be used to determine residual tube life and therefore decide the time at which the tubes need replacing. Other techniques simply package the results into A, B, C type categories which does not provide sufficient detail nor take into account the wide scatter within a furnace in respect of tube damage. Unfortunately, in a reformer when it comes to predicting which tube may fail first, variation in tube life is a fact of life due to the following factors. Wall thickness variation within manufacturing specification and tolerance. Material variation in chemistry and macrostructure between separate tube section casts. Temperature variation due to reformer design, flue gas flow plus uncertainty, and errors in temperature measurement. The later factor is particularly important as relatively minor differences in temperature have a big impact on tube life, typically a 20÷C increase in tube temperature will reduce the life by 50% . So clearly, in order to carry out remaining life assessment of tubes in steam reformers, another key piece of information is reliable temperature measurements. Most temperature measurements collected today contain inaccuracies due to uncontrollable variables such as background radiation, emissivity, and flue gas composition as these are not taken into account, see Figure 15. Inaccuracies of >40°C are quite common. Techniques have been developed which allow the temperature readings to be corrected removing these particular variables. Johnson Matthey can also, in certain circumstances, offer other measurement techniques for more accurate measurement . Even ignoring the variables in the tube operating environment, some tubes will fail before the expected design life. Primarily this is because the design methodology utilises a probabilistic approach based on analysis of controlled short term destructive testing of tube samples. In most cases, 95% of tubes will actually exceed the design life - this does mean that 5% of the tubes will not reach design life (Figure 16) which has significant implications for long term plant reliability. As previously discussed, often plant temperature measurements are an overestimate of the actual tube temperature. This means that start of failures will be later than expected as the tubes in practice may last much longer than their nominal design life based on the measured tube wall temperatures. This is illustrated and shown in Figure 17. This is seen in practice with a number of inspections having been recently completed on reformers with 20 year old tube sets which have been shown to be only part way through their useful life as they have not subjected to any significant creep strain. The output from a LOTIS inspection of a large reformer containing 680 tubes is shown plotted as number of tubes (frequency) verses % creep strain (expansion) from this the normal distribution of creep damage expected from the many variable factors with only a few outlying tubes (Figure 18). With this degree of creep tube damage data resolution a process of tube harvesting can be developed to the ultimate extreme. In such cases it becomes possible to operate the reformer from one turnaround to the next without a tube failure. An issue affecting the use of an internal LOTIS inspection to monitor creep strain life achieved with modern reforming catalysts is increasing, thus limiting, the times in which the tubes can be inspected. Improvements in catalyst mean that the average run length between turnarounds has steadily increased from about 3 to 5 years in the last decade. This is illustrated in Figure 19. Some leading operators are now operating primary reforming catalyst for 10 years. For plants having the longest catalyst lives of around 10 years, this decreases the available inspection times to about 2-4 times over the lifetime of the tube, which obviously leaves significant gaps in the inspection frequency. Typically, access may be available to the tube external surface on twice the frequency of the internal surface as plants take intermediate shutdowns where the catalyst isn't changed. Based upon this demand, development has been underway of an "external" LOTIS reformer tube inspection technology. During the design phase of the external LOTIS crawler, priority was given to the physical dimensions of the crawler. Since typically over 75% of the creep strain damage seen in reformer tubes is located below the top of the tunnel or coffin region, this is where tube failures would be expected (Figure 20). The 'external' LOTIS technology has been applied in parallel with the "internal" LOTIS technology in a number of steam reformers to confirm both the crawler and sensor design between the two technologies and also to confirm the validity of the results. Final release of this new "external" LOTIS reformer tube inspection method has now taken place. The newly released "external" LOTIS will compliment the already industry accepted "internal" LOTIS laser reformer tube inspection process. Plant engineers now have the ability to collect tube condition data any time the plant is taken off line, regardless if catalyst is in the tubes or not, to determine the presence and extent of Creep Strain damage. 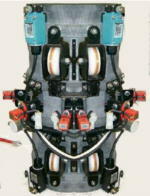 The "external" system employs numerous sensors (Figure 21) similar to that of the "internal" system. High-resolution, 3-Dimensional color images are generated to continue with previous reformer tube management philosophy put in place with the original LOTIS internal laser-based technique. The crawler has the capability of traversing all the way to the bottom of the tunnel (coffin) and up to the floor refractory. The external LOTIS crawlers' sensors were also designed to extend out in front of the crawler to enable data to be acquired right up to either the floor or roof refractory. This is essential to maximizing the opportunity of detecting and quantifying creep strain within a tube, which is filled with catalyst and does not have access to the interior bore. The intent of the new external technique is not to replace the internal "LOTIS" technique; however it is intended to bridge the gap between internal inspection frequencies, which can only be carried out during catalyst change outs. There are a number of variables affecting reformer tube life dependant on many operating factors, design factors, and the degree of control on tube manufacture. The LOTIS technology provides highly accurate tube condition measurement allowing tube lives to be confidently determined and the tube's life extended beyond their nominal design life. LOTIS data combined with the unique visualization software validate phenomena within furnaces. The reformer tube management program now encompasses both internal and external inspection capabilities. A client now has the ability of applying either the internal or external technique, depending upon the presence of catalyst.